From the age of 10, Malala Yousafzai has campaigned for the rights of girls to receive an education. 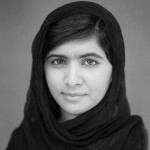 In October 2012, the then 15-year-old Malala was shot by the Taliban while travelling home from school on the bus with her friends. Since the attack, she has become internationally known for her courage in refusing to be silenced and continuing her fight for the right of everyone to receive an education. Malala’s bravery and unwavering dedication to her cause has seen her honored throughout the world, including being named as one of ‘The 100 Most Influential People in the World in 2013 by Time magazine. She is also the winner of Pakistan’s first National Youth Peace Prize and the 2014 Nobel Peace Prize. Following the outpouring of support that Malala received throughout her ordeal, she set up an international fund – the Malala Fund – which is dedicated to help promote education for girls throughout the world.